Washing the Car. My husband and our son (when he was 2). One of the best gifts we can give our children is a work ethic. A lot of questions have come in about getting kids to work. I have also had some about allowances and if kids should be paid for doing chores. There are a lot of different opinions about this. I am going to share with you what I believe is the best, What I teach other families as I work with them and what works in my home. When we train children to work by paying them, we reinforce self interest. It might get the job done in the short term, but it can have negative consequences in the long run. Instead of motivating children, it can turn into parents and children trying to out manipulate one another. Rather than "motivate" children we should open their eyes to the needs that naturally surround them. We don't give allowances in our home. The reasoning: Our children are expected to contribute to the maintenance of our home. They take care of regular responsibilities. They make their beds, clean their rooms, hang up their clothes, put their toys away, etc. I try to teach them to "see" what needs to be done. When they walk past a toy on the floor, I want them to see that the toy is out of place and pick it up and put it away. Not because they get 20 cents or because it is written on a chart, but because they are fulfilling a need. Another reason we don't give allowances for regular around the house chores is to avoid developing the mentality that "I only make my bed, so that I can get something in return." I want them to make their bed so that their room looks nice, to take responsibility for their belongings, so there is order in our home, because it helps our family as we try to keep things clean. If I want a work ethic to be instilled in them, it has to be for the right reasons so it will last throughout their lives. When I do the laundry every day, no one is standing there to give me 2 dollars. I do it for my family, so they have clean clothes, and to keep our house in order. There are some things that we can do in our homes to help children not only learn how to work, but also enjoy working. If we say we don't like laundry, if we sigh and scoff when we have to help kids clean, or do the dishes, our children will pick up on that, and they will develop the same mentality. They will think that household work is miserable. We have to be very careful about the words we say when it comes to work. Working hard to say positive things about work will do much in helping our children to have a good attitude about work. Children like to work. 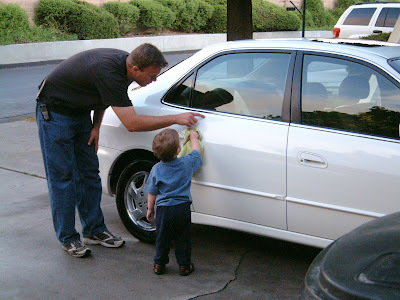 Most children, especially young children, love to work and offer to help. What most children resist and resent is being asked to work alone. "Go clean up your toys in the basement" sounds overwhelming. "Let's go clean up your toys in the basement" sound completely different. Be willing to work side by side with your children. You will love the results. You will also see that things get done faster. It is also a great time to teach them. Our kids match the socks and then get to throw them into the laundry basket across the room like a "hoop". They love laundry day because we "play basketball". Weeding is also turned into a game. We race to pull the weeds, we shoot hoops with the weeds into the trash bags. We play guessing games as we learn the names of the plants. Sometimes there is complaining, every day is not perfect, not even close, but we press on. When work is fun, there is less complaining. This is two fold. First, Provide opportunities for your children to serve others outside your family. Service projects teach children to work. Second, Family life itself is filled with needs. We want to teach our children to see needs and be willing to step up and fulfill those needs. Teach children that it is their moral duty to respond to the needs of others. Mowing the lawn and taking out the trash are needs that need to be tended to when the trash is full and the lawn is overgrown, not when we "feel" like doing it. Don't force or manipulate children to work. Set expectations. Make consequences clear. Then be patient, of good cheer, and show an increase of love. Children will come around. P.S. if you are looking for ways to pay children, or help them earn extra money, have them work in your neighborhood. Mowing lawns, starting their own lemonade stands, baby sitting, pulling weeds for neighbors, etc. We have some 8 and 9 year olds in our neighborhood who are too young to babysit alone, so their mothers help. Once a week they put on a 2 hour child care where moms can drop off their kids and go run errands etc. The cost is 2 dollars. My mom always gave us allowance and had a schedule of when certain people did certain chores. It was awful. Our house was always a mess because we only cleaned when it was our turn and had no motivation other than a weekly stipend to even do that. We do things differently in our house, and it works so much better. I completely agree with everything you said. Visiting from the Blog Frog. I loved this. LOVED it. We grew up with an allowance - one dollar per year of age. I believe it started when we were 8. I never associated allowances with doing chores - and our family motto was: We all Share the Work and we All Share the Play. I always figured I'd give my kids an allowance when they were old enough so they'd learn how to spend money. But the idea of having to EARN the money they spend is so much better. And I really need to watch my 'tude about chores. I probalby always grumble about laundry. Thanks for a well written post. It has given me lots to think about... Time to put on the kettle for a cuppa and have a re-read!